Goodreads Preview: For over a decade, Jenna Metcalf obsesses on her vanished mom Alice. Jenna searches online, rereads journals of the scientist who studied grief among elephants. Two unlikely allies are Serenity Jones, psychic for missing people who doubts her gift, and Virgil Stanhope, jaded PI who originally investigated cases of Alice and her colleague. Hard questions and answers. 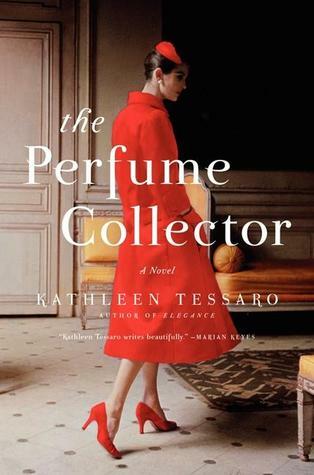 Goodreads Preview: A remarkable novel about secrets, desire, memory, passion, and possibility. Newlywed Grace Monroe doesn’t fit anyone’s expectations of a successful 1950s London socialite, least of all her own. When she receives an unexpected inheritance from a complete stranger, Madame Eva d’Orsey, Grace is drawn to uncover the identity of her mysterious benefactor. Weaving through the decades, from 1920s New York to Monte Carlo, Paris, and London, the story Grace uncovers is that of an extraordinary women who inspired one of Paris’s greatest perfumers. Immortalized in three evocative perfumes, Eva d’Orsey’s history will transform Grace’s life forever, forcing her to choose between the woman she is expected to be and the person she really is. Goodreads Preview: A luminous first novel, set in Greece, Scotland, Greenwich Village, and Long Island, that traces the members of a Scottish family as they confront the joys and longings, fulfillments and betrayals of love in all its guises…In prose rich with compassion and wit, Three Junes paints a haunting portrait of love’s redemptive powers. Old Nick has held her captive for seven years. Through her fierce love for her son, determination, and ingenuity Ma has created a life for Jack in this eleven-by-eleven-foot space. But with Jack’s curiosity building alongside her own desperation, she knows that Room cannot contain either much longer. She devises a bold escape plan, one that relies on her young son’s bravery and a lot of luck. What she does not realize is just how unprepared she is for the plan to actually work. Told entirely in the language of the energetic, pragmatic five-year-old Jack, Room is a celebration of resilience and the limitless bond between parent and child, a brilliantly executed novel about what it means to journey rom one world to another. April’s book club discussion will be on Tuesday, April 26th from 7-9pm at 835 26th Av N. For more information, please contact maurcamp@Verizon.net. Book Club member Dana Mayer picked The Japanese Lover by Isabel Allende for our March book and sent in the following review. Allende’s engrossing narrative spans 70 years of tumultuous world history, but the most powerful message is that love – all kinds of love – will take root and endure under the most harrowing conditions. And unlike her last few books which tended to ramble, this one harkens back to the magic found in Allende’s early bestsellers like House of the Spirits and Paula. The Japanese Lover covers a lot of historical and social ground: the European Jewish diaspora, US and European World War II war camps, racism and agism, abortion, and AIDS. And as in all of Allende’s fiction, we find enduring love stories among a large, colorful cast of characters struggling with loss and reconciliation. The novel swirls around the mysterious octogenarian Alma Belasco who is cared for by Irina Bazili, the young Moldovan immigrant whose past – like Alma’s – casts a shadow on the present. As the story flashes back to the 1930s and romantic highlights between, we meet Alma’s Jewish family in pre-World War II Europe; the American relatives who adopt her; and the Japanese family who lovingly creates and tends their gardens. We will meet at 486 24th Avenue on Tuesday, March 22 from 7 to 9 PM to discuss this book.